Warning watch where blogger is storing your pictures. 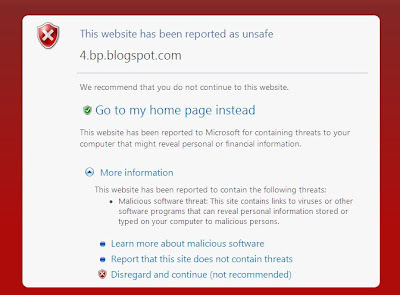 Today someone visited my blog and got this warning on their computer. This lead me on a quest to find out what the problem was. The answer was found in the blogger forums. 4.bp.blogspot.com is a site blogger uses to store the photos you upload to your blog. Apparently there is malware at this storage site. This is only a problem for PCs running Microsoft Windows. How do you fix this problem you ask? Check the html on your photos when you upload them to blogger. Look for this URL in your picture code. These are safe storage sites for blogger pictures. If you find your picture has been uploaded to 4.bp.blogspot.com Remove the picture and upload it again. Check the code again and make sure it has gone to one of the safer sites. This should take care of the problem. Watch your photos and be safe. It is an ugly place out there on the internet with malware, spyware and viruses. Thanks for the warning! I checked my blog and had a couple of pictures that were on the 4page, so I fixed them! thanks for the warning!!! i'm going to go check some of mine and see if they are in the malware spot. i appreciate your time to find this out! Wow! Thanks for the heads-up Beverly. I'm a PC girl, so I'm going to check my photos. thank you very much for the warning! Thanks for sharing this information, Beverly! "Sharing is caring". I am here for the first time. Found your posts interesting.. My wishes!